This month, my SRC assignment arrived in my inbox during a very busy period. I had appointments with Doctors, Optometrists etc. for my annual check ups, and I left the email lurking until I had a few spare moments to peruse A Tale of One Foodie’s Culinary Adventures. At the same time, I had a lot of fun seeing what was being looked at on my blog, and I cannot wait to see what has been made. Erin loves cooking and baking and in her spare time experimenting! Erin and I both enjoy reading and drinking, so I was sure to find a lot of recipes I would enjoy making on her blog. It took me quite some time to settle on what to make. 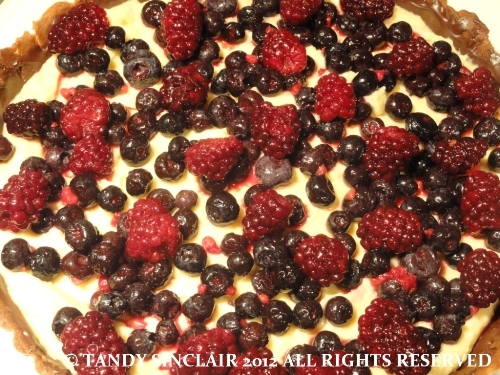 I chose Erin’s adaptation of Anna Olson’s Summer Fruit Flan as I have recently been shopping at the berry farm, and my freezer is full of lovely berries that were freshly frozen. I am running out of freezer space! I also used my own sweet pastry as I thought the orange zest would liven up the berries, and it did. Do you stock up on frozen berries? Mmmmmmmmm! Dangerous post. Note to self – don’t look at food blogs on a fast day! that is my note to self before breakfast! This is such a great looking tart! Who can resist to these berries? You need to keep it on a low heat and don’t leave the stove otherwise you end up with lumpy custard or scrambled eggs 🙂 Please let me know how it works with soya milk! I love stocking up on frozen berries when they’re on super sale–makes a HUGE difference…I love that you made this beautiful stunner on my birthday yaaaay!!! Who can say no to a fruit tart? Yours looks beautiful and sounds wonderful! It is an easy dessert, worth making again and again! This looks good. I’ve never made a tart with pastry cream before and it’s something on my to-do list. Looks delicious.I always have some berries in the freezer – having them has got me out of a fix on more than one occasion. Your tart looks so colorful and wonderful! Now our frozen raspberries have somewhere to go! Great post! Tandy, this looks beautiful. Fruit tart is my absolutely favorite dessert. I made one this summer in a rectangular pan which was stunning. What a stunning even FABULOUS & very delciously looking berry tart! I love it all! What a lovely easy tart.